Located just a 90 minute boat ride from the Port of Brisbane, Moreton Island was unexpected in all the right ways. Part of a chain of the world’s largest sand islands, it resembles nothing I have seen before. Trees and plants flourish, growing up out of the sand. A huge area of sand dunes simply called “The Desert” pops up out of nowhere. Fifteen sunken wrecks line the horizon offshore, close enough for you to swim out to and discover. And the water color resembles the Caribbean a massive difference to the dark and murky water when leaving Brisbane. Moreton Island is, simply put, paradise. We visited the island with a tour company called Sunset Safaris. They provided transportation to and from the island via bus and ferry, supplied lunch and introduced us to some awesome guides. The whole experience was as amazing as it was because of the people involved. They were encouraging and enthusiastic, they were funny but serious when needed (which to my liking, was hardly ever!) While we loved our day tour, we found out afterwards that they also offer an overnight experience. The 2 day tour offers many of the same experiences, with eco glamping and night time transparent kayaking added in. There is also a scenic tour for people who may not want such an active day, that is more catered to sightseeing throughout the island. Although I had apprehensions about the amount of “adventure” required in this tour, I ended up having more fun than I thought was possible. The mixture of adventure and relaxation was perfect for a tour on an island, and the tour company exceeded all expectations I had for our day. We split our time between three main activities: sand tobogganing, snorkelling, and kayaking. We were lucky to be there right before Easter weekend, as that meant that the ferry returned to the island to pick us up later in the evening. There was more time to complete the activities, and we had more relaxed day. Also, because Australia was in its Fall season, we had a smaller tour group than usual. The three activities were wildly different, but all fun to try! As soon as we landed (literally on the shore of the island, there is no dock) it was clear that it was a very windy day. It did not make sense to do the water activities first so we ventured into the forest and out to the sand dunes. Our ride through the forested area was exhilaratingly bumpy. Our 4WD bus was no match for the “roads”, which were really tracks in the sand. My FitBit recorded steps the entire way, and we shook back and forth involuntarily to the beat of the music played over the bus speaker. The adventure had only just begun. The bus pulled up in front of an expanse of sand, with the creative name “The Desert”. The guides handed us each a piece of long and thin plywood with a handle, and then told that was our tobogganing board. We trudged up the side of a sand dune that looked larger and steeper with every step. At the top, instructions were explained. Lie on the “toboggan” face down on your tummy, lift up your elbows, point your toes. I seriously contemplated running back down the way we came, but everyone else seemed to be totally alright with this crazy idea. During my first ride down I closed my eyes the entire way out of fear. I did not want to see the drop in front of me. I did not want to see sand zooming by me. And I definitely did not want to see how close the sand was to my mouth. Oh boy was it a fast ride down. I survived, and quickly realized that had been the easy part. Climbing back up through sand was a mission that culminated in me collapsing into the soft sand at the top. Adrian was even brave enough to try the activity sitting up on the board, and succeeded in avoiding a face full of sand on their creative journey to the bottom of the dunes. Sand tobogganing was fun, but exhausting. My FitBit recorded 119 floors in total, and my legs definitely felt it. After a bumpy ride back to the beach and a break for lunch, we got our gear on to go snorkelling. Outfitted with wetsuits, fins, a snorkel, a mask and gloves to protect our hands from the rusted wrecks, we then had to make a long walk down the beach upstream of the current. Because of the strong current it would be too tough to swim out to the wrecks, so a little boat took us out. It was an experience where we held onto handles, as we were dragged through the water. This was a highly uncomfortable experience in which I held on to Adrian for dear life with my free hand, pushing him under the water the entire time. Thank goodness for the snorkel! View underwater at the wrecks! The snorkeling was awesome, with little colonies of coral and so many varieties of fish. The water was crystal clear and our group was small enough that everyone had their own space to swim around. The guides were kind enough to throw bread into the water so we could witness a fish spectacular. Fish were hitting my body and my mask as they all tried to grab food as quickly as possible. One guide was even able to catch a fish with his bare hands. Spikes covered its body and it was so cool but so creepy to know it was swimming amongst us. After visiting most of the wrecks, we headed back to the shore (by way of being dragged through the water once again). Our guide who caught a fish with his bare hands! Our last scheduled activity of the day was the kayaking. I was absolutely exhausted by then, from a combination of all of the adventure and the hot Australian sun. The wrecks up close! The rust really was that orange! Adrian and I dragged our tandem kayak down the shore, upstream of the current. We tried unsuccessfully to get in, and waterlogged our kayak. After dragging it onto shore and dumping sea water out of the kayak I was already tired and we had not even started. A second attempt at jumping into the kayak was successful and we were off. The kayaks were clear, to allow underwater viewing. I lost my paddling duties within the first five minutes due to lack of coordination. Instead I got to watch fish zoom by underneath us. We (Adrian) paddled around shipwrecks, got to see another bread fueled fish spectacular, and only crashed into other kayaks once or three times! Since the ferry was returning later, we had free time to spend on the beach. As the sun started to set, everyone came to sit by the water and watch the sunset. While in the middle of a conversation, Adrian spotted something out of the corner of his eye. Nobody else saw it, so we continued our conversation. Then a dolphin breached not even five meters from shore in front of us. We all jumped up excitedly and ran alongside it on the shore, trying to follow it and take pictures. The experience of seeing a wild dolphin so close made the sunset over the water even more amazing. A perfect end to a perfect day! Adrian after a day of adventure! 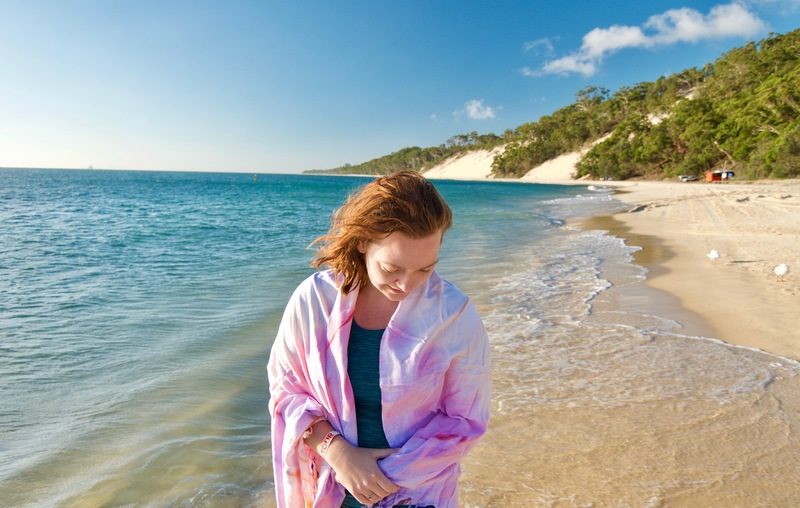 Moreton Island is an adventurer’s paradise. Where else can you combine zooming down sand dunes with shipwreck snorkeling, clear bottom kayaking and close dolphin encounters? If you’re looking for an adventure, Moreton Island is for you! It looks like you had so much fun! I love the photos! I had SO much fun! Wish I was still there now! Thanks so much! I am gutted that I never went to Moreton Island when I drove around Oz last year as your blog and pics look amazing. I love all the things you did, especially the sand tobogganing and kayaking. I am sorry you didn’t get to see it, it is a truly amazing destination. Where in Australia did you travel? It is such a beautiful country! It’s truly a paradise. I love your pictures! I had not yet heard of sand tobogganing, it looks so much fun, I want to go for it!! So many people have said they have not heard of sand tobogganing!! To be quite honest, I had not heard of it either when I first tried it! Thank you so much for the kind comment! You are welcome! It really seems fun. Would love to go for it too! OMG! I would love to try sand tabogganing! That looks cool! I have been to Australia before,but not to Brisbane yet. This island really does look like a paradise! Brisbane is a must do! It is such a cool city, and had some really awesome places nearby. It was a paradise! Shipwrecks were definitely the coolest part, especially because of all the marine life that had made the wrecks into their home. I’ve been to Greece! I spent a month there when I was 18, with a friend’s family! It was a very pristine beach! We had such an awesome time and consider it one of our favorite destinations in Australia! The photos are stunning! Perfect place to vacation, and I would surely like to visit and take tons of photos like you! Thanks! It was a perfect beach day with a whole lot of adventure. We could not put the camera down! You got me interested in sand tabbogganing! Looks like a fruitful and fun trip! You should try it, now that I have tried it I have realized there are many, many places around the world where you can go sand tobogganing. Very cool thing to try! Wow. That is one beautiful island! I would love to get close to those ship wrecks. I have never been to or seen one up close. I will now have to add Moreton island to my bucket list. I MUST find a way to get there! They were so cool up close! It was my first time seeing them from in the water, instead of viewing them from a boat. I hope you can find a way there soon, it is such a cool place! Wow, that water looks absolutely stunning! And sand tobaggoning sounds outrageously fun! I would totally visit here. It was so refreshing and clear! It was all such a fun day! It looks absolutely gorgeous! My husband would love to snorkeling around a shipwreck like that! We will definitely have to check this out! You should definitely check it out, the snorkeling is very unique! Thanks! I would love to be back there now!!! We had such a great time and love telling everyone all about our adventure on Moreton Island! These pictures are UNREAL! I’d love to visit – so glad you guys had a good time! Thanks so much!! They are pretty special pictures. Thanks, we had an awesome day of adventure & exploring! woah! These pictures are so stunning!! I want to go here so bad. The snorkling looks incredible! Thanks for such a great review! It was so incredible, you should definitely try to make it there! Thanks so much for stopping by and taking some time to read! This looks like such an amazing trip. The color of the water is amazing! It was a very amazing trip, and probably my favorite spot in Australia. The water was truly amazing! Hi! I live in Brisbane and grew up going to Moreton Island for family holidays. I’m so glad you loved the island! It really does have a certain magic. It was wonderful to read about your experience and re-live my own previous ones e.g. face-planting at the bottom of the sand dunes you surfed down. Great blog! Thanks so much for leaving this comment! I love when people from the places that I write about leave comments! I am happy to report there was no face planting involved when I was there! I had never done it either! It’s a terrifying concept but really fun once you’ve gotten over the scary part! Water that blue is truly a treat! I’ll have to add Moreton Island to my bucket list. Also glad I’m not the only one who has been banned from paddling in kayak situations :p! It was such an amazing blue! I have been banned since we had a rough day out in the ocean and he realized I was causing more harm than good haha. I am happy to know its not only me!!! What an absolutely fantastic adventure. Do you know if the ship wrecks were actual ship wrecks or just old metal boats strategically placed in the ocean to build coral reefs? Because I’ve seen that done in Mexico. Also – are you telling me that the water is really like that in person? Because that is flipping unreal!!! And to see a dolphin – that is so special! GOOD FOR YOU! It looks like you guys had an amazing time! I would love to visit some day, sounds like paradise! We had such an amazing time! I hope you get a chance to visit because the water is amazing!